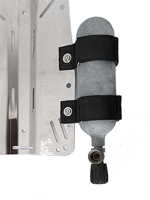 Pair of low profile straps to securely attach argon tank to your backplate. For Argon tanks up to 14 cu. ft. Excellent and at a good price. What's not to like?